Here’s some info about an exibition i did the Sound co ordinating on, it is still currently showing at the Gertrude st Contemporary art space and is well worth a check out, the guys are great and the installation and performances a great succsess. In André Avelãs (PT/NL) live installation work, Earphones, for example, he presents five hundred sets of earphones that are rigged to create a field of sound generated through the feedback between earphones that have been configured as speakers and as microphones. The concept of ‘feedback’ will be present in every work in Feedback Projected (Proposals Towards an Exhibition), whether it is technical, physical or communicative. In The Input / Output Routine (a arrangement of microphones, amplifiers, and loudspeakers) by Koen Nutters and Morten J. Olsen, they create an environment of potentiality, whereby a PA system – with amps and microphones – such as that which would be traditionally used by a rock band is set up in the gallery space and yet remains void of players. The absence of anticipated performers leaves the visually iconic amplification system as the sole protagonist, generating a feedback system that absorbs the sounds of the gallery and articulates the presence of the gallery’s visitors. This investigation of the broader implications of feedback will extend out beyond the traditional exhibition format with artists talks and an active facilitation of dialogue between the artists and Gertrude’s audiences. The exhibition will also encompass a series of performances and off-site events by leading European artists such as MoHa!, allowing for a comprehensive exploration of all facets of the idea of feedback. 8:30 SHARP: MoHa! Performance at Dear Patti Smith (+ drinks until 10pm).The Patterson Building, L2, 181 Smith St, Fitzroy. Special Project(s) to be developed in situ by André Avelãs at Gertrude Contemportary. Further information will be made available on the Gertrude Contemporary website. 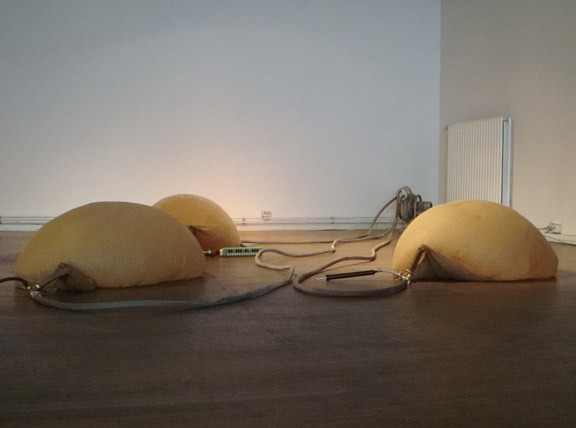 Feedback Projected (Proposals Towards an Exhibition) is supported by the Performing Arts Fund NL. It has received support from the Sound Studio, School of Art RMIT University. Special thanks to Tanzplan Essen 2010. This entry was posted in Music and tagged Installation. Bookmark the permalink.